Jack Vettriano was born in Fife, Scotland, in 1951. He is a self-taught artist in drawing and perspective. In 2004, Vetrianno’s best known painting, The Singing Butler, was sold at Sotheby’s for close to £750,000. We are official stockists of Jack Vettriano works and stock many of his prints in mounted and framed format in our gallery in Hove. 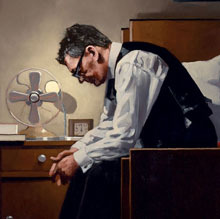 About The Artist : Born in Fife, Scotland in 1951, Jack Vettriano left school at sixteen to become a mining engineer. For his twenty-first birthday, a girlfriend gave him a set of watercolour paints and, from then on, he spent much of his spare time teaching himself to paint. In 1989, he submitted two paintings to the Royal Scottish Academy’s annual exhibition; both were accepted and sold on the first day. The following year, an equally enthusiastic reaction greeted the three paintings, which he entered for the prestigious Summer Exhibition at London’s Royal Academy and his new life as an artist began from that point on. Over the last twenty years, interest in Vettriano’s work has grown consistently. There have been sell-out solo exhibitions in Edinburgh, London, Hong Kong and New York.